As part of the 43rd Internationalization & Unicode® Conference, there will be an exhibit area on Thursday, October 17, 2019 for vendors and service providers related to Unicode, the web, software and internationalization. 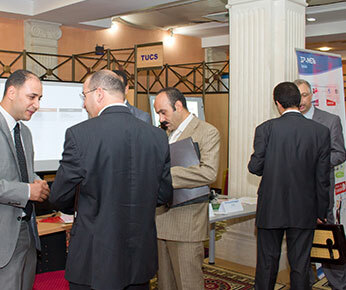 The purpose of the exhibit area is for companies and organizations to demonstrate their products, services or research. Any and all recruiting activities are prohibited. The exhibit are will be located with the Thursday AM & PM refreshment breaks and the Conference Evening Reception. Table top exhibit space is available on a first-come, first-reserved basis. The cost of exhibit space is $1,000 USD, for which we provide a 6' skirted table, electricity and internet connection. You may utilize up to a 10' booth backdrop. Additional equipment and services are available at exhibitor's expense. For more information on exhibiting please contact: Business Development at bd@omg.org, or +1-781-444-0404.